Alison Read, orphaned when she was two years old, had for some years lived and worked with Paul Aylmer, her appointed guardian. Paul, an experienced antique dealer whose business thrived in the south-coast town of Sealock, had come to rely on Alison, who had quickly learned the trade. But when he had asked her to value the contents of Beacon Ride, a chain of events was set off that led to the exposure of a secret he had for years managed to conceal. As a result, Alison’s relationship with Paul came under threat and she knew that only by confronting the situation head-on would her ambitions be realised. 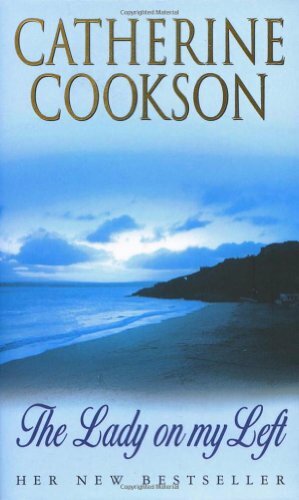 Part-mystery, part-love story, and with its fascinating glimpses of the world of antiques in the 1960s, The Lady on my Left displays yet another facet of Catherine Cookson’s remarkable talent. I enjoyed reading this book, but some parts was a little too cheesy for me. It was too much 'Oh, Paul!' from Alison. Also the storyline was a little bit see through. It was a nice story and I had planned to give it a seven, but the ending was somewhat disappointing. Not what happened, but instead the way the characters acted and so on. Of course I am a huge fan of Nelson's dialect. I love reading books where the dialoge from some characters isn't pure English. As English is not my mother tongue it is somewhat challanging to figure out what he's saying, and I love it. For the same reason I love reading scenes with Hagrid in the Harry Potter books. Conclusion: Not exactly my kind of book, but still was a nice read. Sent to the winner of the EU Birthday Sweepstake! Congratulations! I hope you'll enjoy the book. Thanks for sending this one, I'm not sure when I will get around to reading it as my TBR pile is now ginormous!